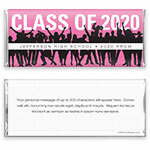 Celebrate grad in style with this party-perfect wrapper design. Design: Silhouettes of graduating students celebrating. Personalization: Front year and message, back message.